So far acadianfamily has created 1 blog entries. We would like to encourage everyone to purchase our Certified Organic, Oklahoma-grown, Sweet Potatoes for your Thanksgiving meal this year. Red and Orange varieties are both available from our farm and are cured, ready to go, and oh so good! Think Sweet Potato Casserole, Candied Yams, Sweet Potato Pie, Sweet Potato Bread, Sweet Potato Biscuits, Pancakes, Waffles, etc. etc.!! If you’re needing recipes, check out our “Sweet Potato Recipes Links” tab at the top of the page here. 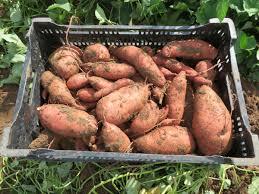 It will connect you with both the Louisiana and Mississippi Sweet Potato Councils, who publish an abundant supply of wonderful Sweet Potato recipes. If you would like to purchase some of our Sweet Potatoes, you can find them at the following stores: Whole Foods Markets (OKC & Tulsa), Natural Grocers (Norman, OKC, Edmond, South OKC, & Tulsa), Green Acres (OKC), and Homeland (Yukon & N. May, OKC). They can also be purchased on the monthly Oklahoma Food Coop.